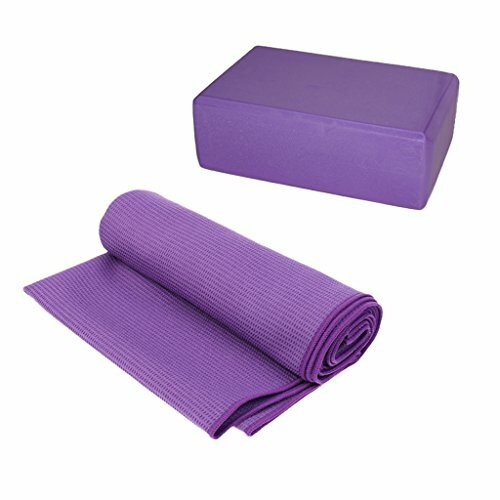 - The ultimate yoga towel for hot vinyasa flow yoga. - Acts as substitute for yoga mat, fits perfectly over top of yoga mats. - Silicone surface provides a quick drying and super absorption experience. - Tightly woven fibers embedded with silicone produce soft, suede feeling on feet. - Sturdy, durable and lightweight. - Made of non-toxic EVA material. - This smooth textured foam is perfect for you to do exercise and keep fit. Please allow 1-3cm / 0.4-1.1inch differs due to manual measurement. Real color may slightly different from pictures due to computer screen's resolution, brightness, contrast etc. Hope understanding. * The ultimate yoga towel for hot vinyasa flow yoga. * Helps to adjust the big toe to prevent valgus, protect pain, relief stress. * Silicone surface provides a quick drying and super absorption experience. * Acts as substitute for yoga mat, fits perfectly over top of yoga mats. B YOGA B Block Block Yoga Block, Cork, 4"
Sport Force 100119 Yoga Blocks, Pink, 9"X6"X3"